The house featured in the film. 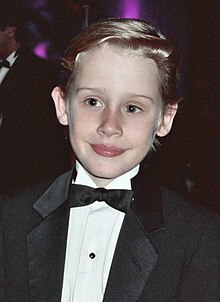 Macaulay Culkin at the Governor's Ball after the Emmy Awards in 1991. Home Alone is a 1990 American comedy action movie mostly set in Chicago, Illinois, Paris, Dallas, and Scranton. It was written and produced by 20th Century Fox by John Hughes and directed by Chris Columbus. It stars Macaulay Culkin and features Joe Pesci, Daniel Stern, John Heard, Catherine O'Hara, Roberts Blossom, and John Candy. The film follows Kevin McCallister (Macaulay Culkin), an eight-year old boy who is mistakenly left behind by his family when they go on a vacation to France, over Christmas. While his family is gone, Kevin initially relishes being alone and learns to take care of himself, but soon his excitement sours as he must stop two bumbling burglars, Harry (Joe Pesci) and Marv (Daniel Stern), who are planning to rob every house in his neighborhood, from trying to burgle his house too by setting up a series of booby traps. After falling for most of Kevin's booby traps, Harry and Marv trap him in a vacant house that they robbed earlier and plan to kill Kevin, but his elderly friendly neighbor, Old Man Marley (Roberts Blossom), sneaks in, knocks them unconscious with his snow shovel, takes Kevin home, and the burglars get arrested. The next morning, it is Christmas and Kevin's parents and siblings come back, while his aunt, uncle, and cousins are still in France. The film was very popular and was followed by four sequels (two theatrical sequels and two made-for-television films): Home Alone 2: Lost in New York (1992). This film brought back most of the original film's cast and has a similar plot and continuity. Home Alone 3 (1997) had different kids and villains. Home Alone 4: Taking Back the House (2002) is the first made-for-television movie and features some of the main characters from the first two films, but with a new cast. Like Home Alone 3, Home Alone 5: The Holiday Heist doesn't revolve around Kevin, but with newer characters and is the second made-for-television movie. In its opening weekend, Home Alone grossed $17 milliion in 1,202 theaters. The film was nominated for Best Original Score and for Best Original Song. Composer John Williams wrote the music for the movie, as well as Home Alone 2, and some popular songs that have already existed were played during the movie as well.